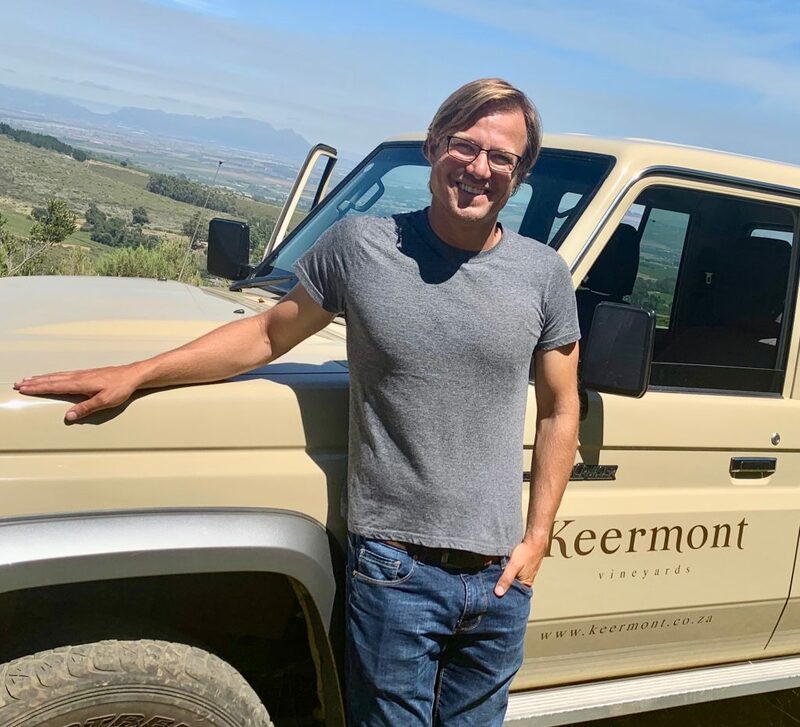 We recently revisited Keermont Vineyards, located just south of Stellenbosch, and tasted through the portfolio with winemaker Alex Starey. Keermont is one of South Africa’s stellar wineries. Located in the Upper Blaauwklippen Valley, it has 29 hectares of manicured, hillside vineyards. About 2/3 of the fruit is used to produce the estate’s 5 thousand case production. The Keermont winery previously served as spring water bottling plant for the estate’s Fleurfontein spring now used for irrigation. Mark and Monica Wraith purchased the existing 8 hectare vineyard in 2003, and in 2005 began planting additional vines. One of their wisest, early decisions was to hire Stellenbosch grad Alex Starey to manage the vineyard development. With prior work experience in Priorat, St-Emilion, and Côte Rôtie, Alex continues to serve as vineyard manager and winemaker to this day. The vineyards of Keermont lie at 250-400m altitude on north-facing and west-facing slopes of the incredibly beautiful Blaauwklippen Valley. The vineyard is divided into blocks or single vineyards separated by tracts of native Fynbos and Renosterveld vegetation. While most vines are traditionally trellised, there are also blocks of dry farmed bush vines and newly planted Syrah using the echalas (goblet vine with a pole) system widely found in Côte-Rôtie. Alex follows non-interventionist practices in making wine. The wines are spontaneously fermented, never acidified, never pumped, and bottled without filtration. Depending on the variety, fermentation takes place in concrete, stainless steel or barrels, most of which are seasoned 500L French oak casks. Bottling is done without filtration. As can be seen from our reviews, the Keermont wines are exceptionally well made. Alex picks on acidity, and the wines are consistently fresh and balanced. The US importer is Kysela. Note: We first tasted at Keermont while doing the groundwork for our report on The Wines of South Africa in late 2011. Since that time we have published other reports and many articles on South African wine. The list of reports can be found here. Keermont 2016 Terrasse Stellenbosch ($27) 91 Always a crowd pleaser, the Terrasse shows very appealing white stone fruit, lemon curd and floral scents. Softly textured with good backbone and firm acidity complementing riper stone fruit and citrus flavors. A blend of 39% Chenin Blanc, 34% Sauvignon blanc, 14% Viognier and 13% Chardonnay fermented and aged in used 500L barrels for 12 months. Lees stirred only during fermentation then left to sit on the lees.13% alc. Keermont 2017 Riverside Chenin Blanc Stellenbosch 93Subtle bouquet of orange blossom, cling peach, and beeswax. Taut and focused, revealing dried orange peel and apricot pit on a dense, mineral like palate. Sourced from the oldest vineyard on the farm, planted in 1971-2, it’s a selection of the best 500L barrels. About 250 cs produced. 13.5% alc. Keermont 2015 Topside Syrah Stellenbosch ($62) 93A very freshly styled, peppery Syrah revealing plum, raspberry and fynbos aromas. Spicy red fruit and vibrant acidity show on the palate with fine, gripping tannins. Fermented in concrete and stainless steel and matured in mostly 500L neutral barrels for about 22 months. 13.5% alc. Keermont 2015 Steepside Syrah Stellenbosch 92Enticing, complex nose of dark red berry fruit with a whiff of game. Soft on the attack with a silky palate feel and rich fruit complemented by a meaty note, finishing with firm tannins. Sourced from north facing, hillside vineyards and picked riper than the Topside. Keermont 2014 Syrah Stellenbosch ($40) 91 An expressive wine with a hint of garrique on the nose and slow mounting spiciness on a fleshy, smooth palate. Macerated dark cherries, black olives and a touch of smoked meat combine to offer a deliciously flavored, generous wine. Keermont 2013 Estate Reserve Stellenbosch ($40) 92This is Keermont’s flagship wine, the first wine made under the label in 2007. It sees 2 years in oak and is kept in bottle another 2 years before release. Richly aromatic with spice and fynbos/herbal notes. Fabulous, layered texture of rich, dense dark red fruit seamlessly integrated with toasted oak. A blend of 36% Merlot, 27% Cabernet Sauvignon, 17% Cabernet Fanc, 10% Malbec, 6% Syrah and 4% Petit Verdot. 14.5% alc. Alex has been gradually increasing the percent of Cabernet Franc in this wine over time. Keermont 2015 Cabernet Sauvignon Stellenbosch 91Medium dark red. Finely perfumed of red and black currants with hints of dried spices. Silky mouth feel with impressive intensity of balanced fruit, cedar hints and lively acidity. More finesse than power in this elegantly styled wine. Sourced from a single, exposed parcel on top of the ridge with low yields. 14.5% alc. Keermont 2015 Pondokrug Cabernet Franc Stellenbosch ($52) 93 Sourced from the top two terraces of the vineyard up near the reservoir, this single parcel Cabernet Franc reveals good typicity and impressive depth of plum and dark cherry fruit. Creamy, lush texture on a full bodied palate with fine firm tannins. Matured 20 months in used French oak. The name means hut (pondok) on the ridge (rug) in Afrikaans. This entry was posted in Cabernet Sauvignon, Countries and Regions, Red Wine, South Africa, Uncategorized, White Wine, Wine Type and tagged Blaauwklippen, Featured, Stellenbosch. Bookmark the permalink.